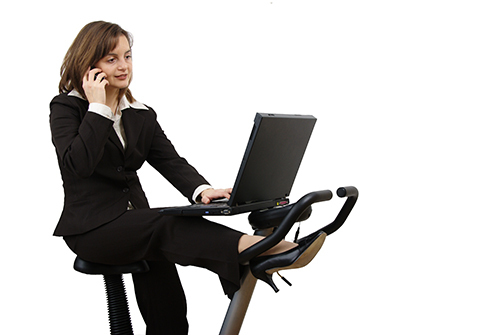 A new study published in the American Journal of Preventive Medicine suggests that providing office workers with portable pedaling devices under their desks can inspire employees to be more active. The study, conducted by researchers at the University of Iowa, found that workers who pedal more are more likely to report weight loss, fewer sick days, and improved concentration compared to workers who pedal less. The trial included 54 overweight or obese individuals who were otherwise healthy and had sedentary jobs and lifestyles. They were split into two groups: the first group received a thirty-minute consultation from an ergonomist and three weekly e-mail reminders on tips for improving their physical activity levels and optimizing their workstations. The second intervention group, in addition to the aforementioned, received elliptical machines that fit comfortably under their desks. Pedaling activity was tracked and participants received real-time feedback. Measurements were taken at baseline and at 16 weeks. Measurements included heart rate, blood pressure, activity level (time spent sedentary versus active), height, weight, and body composition. Researchers discovered that those using the elliptical machines were pedaling an average of 50 minutes per day. They showed improvements in weight, total fat mass, resting heart rate and body fat percentage. More so, their productivity levels improved, increasing their concentration and decreasing days missed due to illness. In fact, 70% of participants opted to keep their machines at the end of the intervention. University of Iowa, “Work, pedal, and be happy,” ScienceDaily web site, August 10, 2015; www.sciencedaily.com/releases/2015/08/150810091903.htm.